Context: Regional anesthesia may attenuate adverse physiological stress responses associated with cardiothoracic surgery. 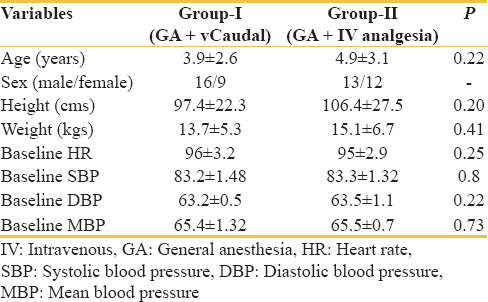 In this study, hemodynamic stress response at the different time of surgical stimuli was compared between patients receiving general anesthesia (GA) along with caudal epidural analgesia with GA with intravenous analgesia in pediatric population undergoing open-heart surgery. Aims: This study aims to compare the hemodynamic response at the different time of surgical stimuli and postoperative pain score, in pediatric patients undergoing open-heart procedures. Settings and Design: We designed a prospective randomized controlled trial to study hemodynamic effects between Group I and Group II. Fifty patients were randomly allocated equally into Group I (GA + caudal epidural) and Group II (GA + intravenous analgesia) by sealed envelope technique. Subjects and Methods: After obtaining approval from Institutional Ethical Committee, this prospective study was conducted in 50 American Society of Anesthesiologist Classes II and III pediatric patients aged between 1 and 12 years posted for cardiac surgery in our institution. Statistical Analysis: ANOVA, two-way ANOVA, and Student's test. Results: The heart rate, systolic blood pressure, diastolic blood pressure and mean blood pressure variations were compared between Groups I and II at different time intervals. The variations were found to be significantly higher at the time of skin incision and 2 min after skin incision in Group II as compared to Group I. Pain score was compared between the groups and was found to be significantly lower with Group I (2.5 ± 1.2) as compared to Group II (4.6 ± 1.7), P = (0.004). Conclusions: Caudal analgesia with GA (Group I) was found to have better hemodynamic control and significantly better postoperative pain relief in the first 24 h after awakening. Regional anesthesia may attenuate adverse physiologic stress responses associated with cardiothoracic surgery, including alterations in circulatory (tachycardia, hypertension, and vasoconstriction), metabolic (increased catabolism), immunological (impaired immune response), and hemostatic (platelet activation) systems. Caudal epidural analgesia, using either local anesthetics or opioids or a mixture of local anesthetic with opioids is being increasingly used in the pediatric population. Buprenorphine, a long-acting opioid receptor partial agonist, is increasingly being used in epidural space for intra- and post-operative analgesia. A prospective randomized controlled trial was conducted in our institute to study whether adding buprenorphine caudal analgesia with general anesthesia (GA) provides any hemodynamic benefits and better postoperative analgesia when compared to standard protocol of GA with intravenous narcotic analgesia. After obtaining approval from Institutional Ethical Committee, this prospective study was conducted in 50 American Society of Anesthesiologist (ASA) Classes II and III pediatric patients aged between 1 and 12 years posted for cardiac surgery in our institution. Patients with (1) coagulation abnormalities, (2) systemic infection/local infection at caudal site, (3) neurological abnormalities, (4) hypersensitivity to buprenorphine, (5) severe left ventricular dysfunction, (6) severe spinal deformity, and (7) increased intracranial pressure were excluded from the study. Fifty patients were randomly allocated equally into GA + caudal (Group I) and GA + intravenous analgesia (Group II) by sealed envelope technique. Informed consent was obtained from parents or legal guardians of the patients. Patients up to 10 kg with syrup - triclofos: 100 mg/kg body weight. Above 10 kg tablet lorazepam 0.1 mg/kg mg and tablet ranitidine 2 mg/kg orally. A standard induction protocol was followed in all the patients. Before surgery, pulse oximeter, 5 lead ECG, and NIBP were connected, and patients were preoxygenated with 100% oxygen, then 8% sevoflurane was added for inhalational induction, and intravenous line was obtained. Subsequently, the patients were induced with intravenous ketamine 2 mg/kg, fentanyl 5 μg/kg, and midazolam 0.05 mg/kg of body weight, and intubated after giving pancuronium 0.1 mg/kg body weight. After intubation, sevoflurane was substituted for 1.2% isoflurane. Anesthesia was maintained with 50% oxygen in air along with isoflurane up to 1 minimum alveolar concentration, muscle relaxation was maintained with pancuronium bromide. In Group I, patients were given caudal block in the left lateral position with injection buprenorphine 5 μg/kg, diluted to 1 ml/kg. The caudal space was identified by palpating upward from the coccyx, and the highest point of sacral hiatus was identified. A 22-G needle was introduced, and the position was confirmed with the “Woosh test.” Preloaded buprenorphine was injected after aspirating and confirming the position of the needle. In case of a bloody tap, the needle was withdrawn, and no further attempt was made. After caudal blocks, arterial line and central venous line were inserted in supine position. Surgery started in Group I with no additional intravenous analgesics except a rescue dose of narcotic if needed based on the criteria described afterward. In Group II, patients were given 10 μg/kg fentanyl in divided doses till sternotomy. Subsequently, fentanyl 1 μg/kg was given every half hourly when the patient was on pump, and 2 μg/kg fentanyl was given on rewarming. The interval between caudal injection and heparinization was regulated to a minimum of 1 h.
In the intraoperative period, intravenous fentanyl was administered as rescue analgesic in the dose of 2 μg/kg when heart rate (HR)/mean blood pressure (MBP) increased more than 20% of the baseline. In the postoperative period, if pain score was ≥4, intermittent intravenous fentanyl 2 μg/kg was given and titrated to keep a pain score under 4. Hemodynamic responses in terms of systolic blood pressure (SBP), diastolic blood pressure (DBP), MBP, and HR were noted before, at, 2 min after and 4 min after the skin incision, sternotomy, sternal closure, and skin closure. The time interval from caudal injection of buprenorphine to heparinization and skin incision were noted, also number of rescue analgesic doses required during operation and in the postoperative period was also noted. After surgery, patients were shifted to pediatric intensive care unit and electively ventilated. The pain score was noted according to FLACC scale in children below 5 years and visual analog scale in children above 5 years. If pain score was ≥4, intermittent intravenous fentanyl 2 μg/kg was given and titrated to keep a pain score under 4. Pain scores were noted once the patient was awake, and every 2 hourly till 24 h by trained ICU nurses. Postoperatively, all patients in Group I were evaluated neurologically for lower limbs weakness, once patients were awake and after reversal from the effect neuromuscular blockade. The two groups in this study were designated as Groups I and II. The total size of the study population was 50 with 25 patients in each group. The demographic data, baseline HR, SBP, DBP, MBP, and number of rescue analgesic doses required were comparable, and there were no statistical differences between the groups [Table 1]. HR response at the time of skin incision (109.9 ± 2.9 vs. 115.64 ± 2.3) (P = 0.0001) and 2 min after skin incision (110.64 ± 2.82 vs. 120.60 ± 2.1) (P = 0.0001) was found to be significantly higher in Group II as compared to Group I. Rest of the time, the data obtained were comparable and not statistically different between the groups [Table 2]. The SBP response at the time of skin incision (90.2 ± 1.54 vs. 96.3 ± 2.25) (P = 0.0001) and 2 min after skin incision (92.4 ± 2.5 vs. 98.6 ± 2.2) (P = 0.0001) was found to be significant in Group II as compared to Group I (P = 0.001). Rest of the time, the data obtained were comparable and not statistically different between the groups [Table 3]. DPB response at the time of skin incision (65 ± 2 vs. 68 ± 4.2) (P = 0.0001) and 2 min after skin incision (67.50 ± 3.5 vs. 72.5 ± 2.5) (P = 0.0001) was found to be significant in Group II as compared to Group I (P = 0.001). Rest of the time, the data obtained were comparable and not statistically different between the groups [Table 4]. MBP at the time of skin incision (68.24 ± 1.80 vs. 74.68 ± 3.28) and 2 min after skin incision (69.32 ± 2.09 vs. 75.00 ± 2.73) was found to be significant (P = 0.001) in Group II as compared to Group I (P = 0.001). Rest of the time, the data obtained were comparable and not statistically different between the groups [Table 5]. The hemodynamic response to skin incision showed a statistically significant increase in Group II at the time of skin incision and 2 min after, although in most cases, it was not clinically significant warranting a rescue dose of fentanyl. The rescue dose was required in three patients in Group I and four patients in Group II. The pain score was noted according to FLACC scale below 5 years and visual analog scale above 5 years. If pain score was ≥4, intermittent intravenous fentanyl 2 μg/kg was given and titrated to keep a pain score under 4. Pain score was noted once the patient was awake and every 2 hourly until 24 h by trained ICU nurses [Table 6]. The postoperative pain scores were significantly lower in Group I as compared to Group II, (2.5 vs. 4.6) (P < 0.0001). Six out of 25 (24%) patients in Group I required rescue analgesic in first 24 h, whereas, 20 out of 25 (80%) patients in Group II received intermittent fentanyl 2 μg/kg as rescue analgesic in the first 24 h.
The use of epidural opioids for control of postoperative pain has achieved widespread recognition and acceptance in clinical practice since the introduction of this technique in 1980. Caudal approach to epidural space for anesthesia and analgesia has been more enthusiastically noted in children, especially for genitourinary and lower limb procedures.,,,, Deborah et al., (1990) in their study used epidural catheter through caudal route in children undergoing thoracic and variety of gastrointestinal procedures between 2 days and 18th months of age and weight 1.4–12 kg. Serlin et al., did a study to determine whether a single dose of morphine sulfate is effective in providing 12–24 h pain relief in 113 children from 2 months to 15 years of age. They concluded that single-dose caudal epidural morphine in children undergoing thoracic and abdominal surgery is safe and effective. Various studies using different narcotics with or without local anesthetics have shown caudal analgesia to be safe and effective in openheart surgeries.,,,,, Rosen and Rosen, in a study of 32 children aged 2–12 years used caudal morphine and concluded it to be safe and effective in the treatment of postoperative pain in children following open heart surgery. Peterson et al., in their retrospective study in 220 pediatric patients had shown that regional anesthesia was safe and effective in cardiac surgery. Buprenorphine is a synthetic opioid agonistantagonist having a high receptor affinity and lipid solubility, compared to morphine which tends to stay longer in the water phase of the cerebrospinal fluid and spread more widely and rostrally in the spinal canal due to hydrophilic nature. Buprenorphine can reach the brain more quickly due to rapid uptake by epidural veins as in Moore et al's. study. Therefore, it may be preferable to morphine when used per operatively as a preemptive agent.,,, Girotra et al., in 65 children aged between 1 and 10 years using 4 μg/kg found caudal Buprenorphine equally effective as morphine. They concluded that analgesia in buprenorphine is better due to longer duration of analgesia and lesser side effects (pruritus, nausea, and vomiting). Various doses of buprenorphine have been used ranging from 3 μg/kg to 8 μg/kg.,, We choose a middle value of 5 μg/kg based on the prevalent practice in our institution. We decided to study only analgesia and not anesthesia and standardized the volume of buprenorphine to 1 ml/kg body weight. Regional anesthesia may attenuate adverse physiological stress response, in terms of circulatory cortisol level, metabolic response, in terms of blood glucose level, immunological response, i.e., impaired immune response and hemostatic response, i.e., platelet activation. Erol et al. did a randomized study in 33 pediatric patients; one group had received only caudal bupivacaine and other one, bupivacaine + sufentanil. They concluded that bupivacaine itself can reduce stress response and the addition of sufentanil offers no extra advantage. The addition of regional anesthesia has been shown to provide stable circulatory response/hemodynamic response.,,, Dalens and Hasnaoui did a retrospective study in 750 children receiving caudal analgesia in pediatric surgeries and concluded that hemodynamic disturbances were infrequent and there was longlasting pain relief. Hammer et al., (2000) found greater circulatory stability in patients with epidural blocks undergoing cardiac surgery. Bichel et al., did a study in 24 children undergoing pediatric cardiac surgery in two different groups, combined epidural and general anesthesia (EPI; n = 12) and deep opioid anesthesia (DOA; n = 12). They concluded that hemodynamic stability is similar in both groups. Rojas-Pérez et al., did a study in 30 patients undergoing palliative or corrective cardiac surgery. They concluded that cardiovascular and hemodynamic responses of those patients who had received caudal block showed minor variations during the 20 min between caudal and GA. Rosen and Rosen in a study of 32 children aged 2–12 years using caudal morphine concluded to be safe and effective in the treatment of postoperative pain in children undergoing openheart surgery. In our study, there was no incidence of bloody tap or dural puncture in the caudal group. The immediate postoperative complications such as nausea, vomiting, and urinary retention were not studied as 44/50 patients were electively ventilated for 12–20 h. No neurological deficit was observed in any patient. The postoperative pain score was consistently below 4 in the caudal group (Group I) and only 24% of patients required intermittent fentanyl 2 μg/kg in first 24 h. In Group II, 80% of patients received rescue analgesics in the first 24 h. The average pain score in the caudal group was 2.5 versus 4.6 in intravenous analgesia group. In the above study, two parameters, i.e., hemodynamic response and postoperative pain score were studied as indicators to measure the effectiveness of caudal buprenorphine in pediatric patients undergoing openheart surgeries. The hemodynamic response at the time of skin incision and 2 min after skin incision was significantly higher in Group II as compared to Group I (P = 0.0001). The hemodynamic response to further stimuli of sternotomy, sternal closure, and skin closure did not show any significant changes in the groups, implying effective and comparable analgesia. Postoperative pain scores were better in caudal Group as compared to IV analgesia Group up to 24 h. In our study, not a single patient had any neurological deficit after caudal analgesia. There was no case of late respiratory depression in caudal analgesia group. We conclude that opioid analgesia through caudal route is more effective in attenuating the hemodynamic response to skin incision as compared to intravenous analgesia as it provides more effective pain relief. However, at other study interval, caudal opioid analgesia was found to be as effective as intravenous opioid analgesia in pediatric patients undergoing openheart surgery. We conclude that opioid analgesia through caudal route is more effective in attenuating the hemodynamic response to skin incision as compared to intravenous analgesia as it provides more effective pain relief. However, at other study interval, caudal opioid analgesia was found to be as effective as intravenous opioid analgesia in pediatric patients undergoing open-heart surgery. Magora F, Olshwang D, Eimerl D, Shorr J, Katzenelson R, Cotev S, et al. Observations on extradural morphine analgesia in various pain conditions. Br J Anaesth 1980;52:24752. Capogna G, Celleno D, Tagariello V, Loffreda-Mancinelli C. Intrathecal buprenorphine for postoperative analgesia in the elderly patient. Anaesthesia 1988;43:12830. Kamal RS, Khan FA. Caudal analgesia with buprenorphine for postoperative pain relief in children. Paediatr Anaesth 1995;5:1016. Serlin S. Singledose caudal epidural morphine in children: Safe, effective, and easy. J Clin Anesth 1991;3:38690. Girotra S, Kumar S, Rajendran KM. Comparison of caudal morphine and buprenorphine for postoperative analgesia in children. Eur J Anaesthesiol 1993;10:30912. Anilkumar TK, Karpurkar SA, Shinde VS. Postoperative pain relief in children following caudal bupivacaine and buprenorphine – A comparative study. J Postgrad Med 1994;40:614. Rasch DK, Webster DE, Pollard TG, Gurkowski MA. Lumbar and thoracic epidural analgesia via the caudal approach for postoperative pain relief in infants and children. Can J Anaesth 1990;37:35962. Hammer GB, Ngo K, Macario A. A retrospective examination of regional plus general anesthesia in children undergoing open heart surgery. Anesth Analg 2000;90:10204. Peterson KL, DeCampli WM, Pike NA, Robbins RC, Reitz BA. A report of two hundred twenty cases of regional anesthesia in pediatric cardiac surgery. Anesth Analg 2000;90:10149. Bichel T, Rouge JC, Schlegel S, Spahr-Schopfer I, Kalangos A. Epidural sufentanil during paediatric cardiac surgery: Effects on metabolic response and postoperative outcome. Paediatr Anaesth 2000;10:60917. Leyvi G, Taylor DG, Reith E, Stock A, Crooke G, Wasnick JD, et al. Caudal anesthesia in pediatric cardiac surgery: Does it affect outcome? J Cardiothorac Vasc Anesth 2005;19:7348. Rojas-Pérez E, Castillo-Zamora C, Nava-Ocampo AA. A randomized trial of caudal block with bupivacaine 4 mg × kg−1 (1.8 ml × kg−1) plus morphine (150 microg × kg−1) vs. general anaesthesia with fentanyl for cardiac surgery. Paediatr Anaesth 2003;13:3117. Erol A, Tuncer S, Tavlan A, Reisli R, Aysolmaz G, Otelcioglu S, et al. Addition of sufentanil to bupivacaine in caudal block effect on stress responses in children. Pediatr Int 2007;49:92832. Sendasgupta C, Makhija N, Kiran U, Choudhary SK, Lakshmy R, Das SN, et al. Caudal epidural sufentanil and bupivacaine decreases stress response in paediatric cardiac surgery. Ann Card Anaesth 2009;12:2733. Rosen KR, Rosen DA. Caudal epidural morphine for control of pain following open heart surgery in children. Anesthesiology 1989;70:41821. Miwa Y, Yonemura E, Fukushima K. Epidural administered buprenorphine in the perioperative period. Can J Anaesth 1996;43:90713. Moore RA, Bullingham RE, McQuay HJ, Hand CW, Aspel JB, Allen MC, et al. Dural permeability to narcotics: In vitro determination and application to extradural administration. Br J Anaesth 1982;54:111728. Dalens B, Hasnaoui A. Caudal anesthesia in pediatric surgery: Success rate and adverse effects in 750 consecutive patients. Anesth Analg 1989;68:839.